Holy crap, you guys! I can’t believe it’s almost July already! Where did the first half of the year go? Well. Moving, I guess. And getting ready to move. Hrm. Well, you know what they say about time flying and having fun and all that. Anyway! Today is the start of the Tour de France, which happens to coincide with the start of the Tour de Fleece! Isn’t that a weird coincidence? 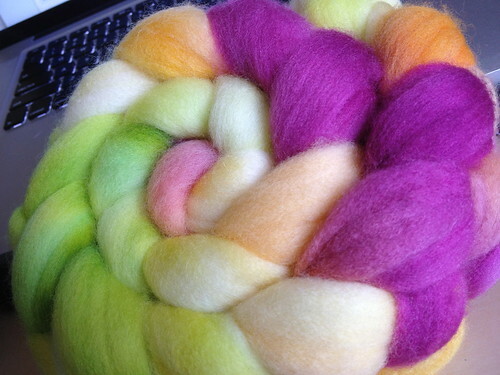 I played along with the TdF back in 2010 and spun up some lovely yarns, plus I had a lot of fun. Not sure why I didn’t do it last year, unless it had something to do w/ my still kind of wonky energy levels. Well, anyway, this year I decided to give it a go again. 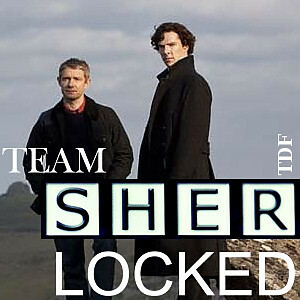 This time I’m playing with Team Sherlocked (an homage to my new favorite show). 3. Finish the alpaca I’ve been working on. This might be a challenge because I kind of got bored with it. 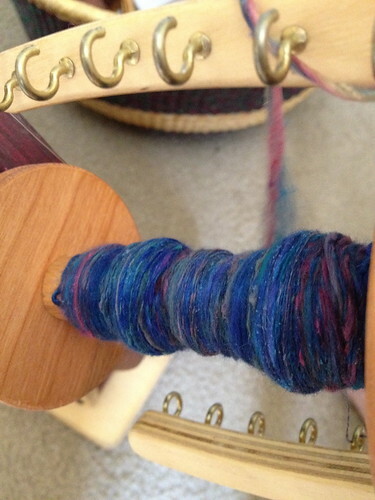 I’ve got a little more than half a bobbin of it and still a huge amount left to go. 4. 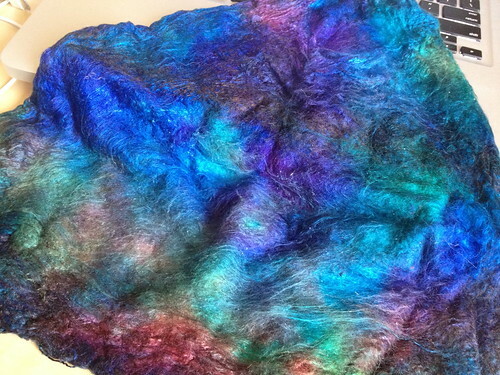 Try to get finished with (or at least spin some of) the Romney fleece. This will definitely be a challenge because a) there is a crapton of it and b) I don’t really care for it that much (sad, I know). In spite of having a clear idea of what I’d like to get done over the course of the TdF, I went ahead and started doing something else entirely. Aren’t the colors pretty? These are the silk caps I got from A Touch of Twist at the CT Sheep & Wool festival a couple of years ago. I’d originally planned to just straight up knit them without spinning the fiber, because Yarn Harlot. But now I’ve moved to Florida and I can’t see that I have a real need for cushy little hand ovens. But I could definitely use a lacy little shawlette to keep the AC chill off my shoulders and so that is the plan. Also I have this little 4 oz Polwarth braid from Woolgatherings which I really can’t wait to sink my teeth into. Isn’t it pretty? I am really going to have to remember to buy more than 4 oz the next time I visit her shop. I can tell that I am going to want to spin this stuff forever.